Michael recently saw our post on the Mini Wood Lathe, decided he wanted to check it out, and ordered one. When it arrived, he was kind enough to send his thoughts on his experience and snap a few pics for us, which we’d like to share with you. Read on past the jump for his opinions and photos. That’s how The Adjustable Clamp company begins its copy on the mini wood lathe, and it’s exactly why I shelled out the $36 (including shipping) for this set up. (I noticed, by the way, that they’re now listing it for $40, pre-shipping.) I had never used a lathe before, but had read quite a bit and was curious as to whether or not I’d like turning. If this sounds like you, I would without hesitation recommend the mini wood lathe to you. I don’t know if this lathe could actually be much more than an occasional use tool, though. Someone doing any kind of production work — from pens to spindles — will want more features and sophistication in a lathe. The mini lathe is relatively simple in construction and pretty sturdy — pretty good bang for your buck. (I spend this much money taking my family out to dinner at Wendy’s.) The bed is a single piece of extruded and formed aluminum. After screwing it to the base I could not feel any flex in it. The drill stand is separate and is also screwed to the base. You attach your drill with a plastic-coated hose clamp. I wasn’t sure if it would be adequate, but was pleased to have no problems with the arrangement during use. The drive center (or the “face plate”) threads onto a drive shaft mounted in a headstock that bolts to the bed — as does the tailstock that carries the live center. You simply chuck the drive center shaft in your drill and you’re good to go. I had originally planned on setting the lathe up on a slab of white oak I had, but the slab was a bit short. Instead I used a chunk of 1 1/2′ particleboard left over from a counter top job sometime in the distant past. You’ll need a base that’s approximately 40″ long, give or take a bit depending on the size of your drill — something with some mass would work best to keep vibration to a minimum. The lathe comes with all the screws needed to mount it and ships partially assembled. I was pleased with all aspects of the construction, except for the two plastic end caps for the bed. They were not quite the right shape, and one ended up falling off after I assembled the lathe and started using it. The lack of the end cap didn’t affect my use of the lathe, though. When I re-do the lathe — I plan on setting it up for my boys to use — I’ll probably ditch the remaining one. Setting up the lathe took about a half hour of unhurried activity. There are no written instructions — just some diagrams — but that shouldn’t stop anyone from putting the lathe together, easily; the pictures are clear and the construction is simple. You need only provide a base and a drill. I used my fairly new Ridgid R7000 (3/8″ VSR) corded drill. It’s a 6.5 amp drill that runs 0-2,500 RPM. 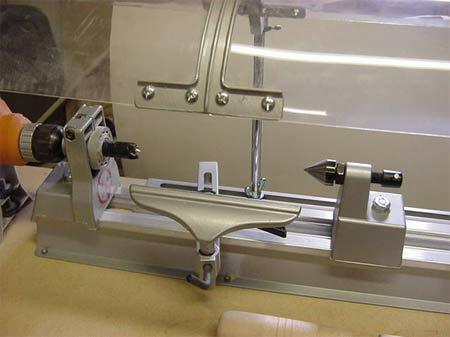 Read on to page two for Michael’s experiences using the mini lathe. Cool review. Would have never considered this (thinking it a mere gimmick) without it. Now I might for a couple of simple small projects I have pending. Thanks. Is there any way to attach a chuck to this lathe? Does anyone know what the spindle thread is? Rob, I’ll see what the spindle thread is and post it. It attaches a little differently with the drill passing through the headstock unit, so you could conceivable use the drill’s chuck. Here it goes, the lathes paperwork lists the threading as “1/2″ – 20UNF”. Hope that helps. Thanks, Michael. I don’t think there is a standard chuck that is threaded 1/2 – 20 but there might be some adapter available. I wasn’t looking for one of these for myself (I already have 4 lathes, 2 wood turning, 2 precision) but a lot of people I know want some sort of turning tool and are using drill presses / hand drills and I was hoping to give them a better option. Thanks! Do you mind sharing what kind of wood lathes you have? This is all new to me and I’m open to any advice that you may have. I have a Jet 1236 (12″ swing, 36″ bed) and a Bonnie Klein Micro lathe (5″ swing, 12″ bed). I have the smaller lathe to travel with me to do turning demos. My best advice other than keep your tools sharp, is match what you are turning to your lathe. The Jet I have isn’t that big and really I shouldn’t turn anything larger than 6″- 8″ around on it, despite the fact that I can swing the headstock around and get something 18″ on there. The reason is mass. More mass = smoother turning. Add to that, the minimum speed is about 500 RPM and something that big is moving pretty fast. Now if you start with something that’s pretty well balanced, you can go larger, but for a log (if you were doing a natural edge bowl or something like that), stay smaller. Let me know if you have any other questions, you can email me offline if you want motodog1991 at yahoo dot com. How does the faceplate attach? I have an old shopcraft lathe that I bought at a garage sale that is missing the faceplate. I uses a 1/2″ – 20UNF spindle and was hoping I could buy and use a replacement faceplate for this lathe. Just for the sake of future searchers who may wind up here, I can confirm that the faceplate for the Jorgensen Lathe does fit the spindle on the Shopcraft lathe. I order one and it spun right on. It is quite lightweight aluminum – lighter even than the other Shopcraft parts, but if you need one, it fits. Hey – I just wanted to say thanks for doing the write-up. I was going to buy a Grizzly hobby lathe, but it turns out that they are out of stock on them until May 20th 2009. I can’t wait that long for one because I have a need for one now. I called the nice folks at Adjustable Clamp Co (link at top of page) and ordered a couple of them. For $39.95 how could you go wrong? I got the Grizzly 1/2 HP 2500 RPM drill to go along with them for $25 ea on sale…so for like $65 plus shipping, I’ve got what I need. Plus, Adjustable Clamp Co. didn’t charge me a $5 oversize charge for shipping like Grizzly would have. 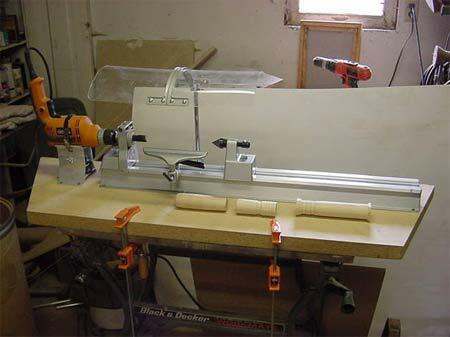 Several years ago I had an idea for a spindle turning system utilizing the table saw as the means of machining parts made of wood, plastic, solid surface(Corian and others) or a combination of the three with a two axis pattern system for making duplicatible turnings. The Adjustable Clamp Co’s mini-lathe provided the perfect off the shelf platform to build the system which I first crudely prototyped before I contracted a machinist to build the final prototype. The TurboLathe is patented and is currently being reviewed by a manufacturer for market feasibility. Check it out on youtube at turbolathe and let me know what you think. I apologize for the crappy video but I haven’t had the time to make a new one. It can be found for much less than $118+ I’ve seen them for ~$80 US on multiple sites.